When Singapore’s most famous contractor wants to shoot in your sister’s house, you drop everything and get there as fast as you can. “PHUA CHU KANG is coming to my house for filming,” my sister Penny casually announced one day in February. “What? When? Why?” I sputtered. Penny had just moved into a new gated community in Klang for a couple of months when the producer of PCK knocked on her door and asked if they could use her house for location shooting. The façade of the house is very Chinese—especially the wooden side door complete with the round metal knocker and matching brown roof. One imagines it’s something that the yellow-booted contractor from Singapore might build for himself. The crew would only be using Penny’s porch for filming. The interior scenes were to be shot in the showhouse nearby. The filming was done over two days. I missed them the first day because I had to accompany my mother on her medical check-up. On the second day of filming, I was ready and waiting at Penny’s house before they came. Two sweet young things rang the doorbell. I opened the gate to let them in. They were casually dressed in T-shirts, Bermudas and sandals. One of them was holding a clipboard. I explained that my sister had to leave for a prior engagement and that I was there to make sure nobody plundered her house. Okay, I made that up. They were professionals, and surely they wouldn’t do anything to jeopardise their reputation. “It’s all right,” they said. “We won’t be using the interior for the shooting but we’ll need to borrow the toilet for a different type of shooting.” Okay, that wasn’t exactly how they phrased it, either. Moments later, the crew started streaming in. I counted more than a dozen people: executive producer, director, assistant director, cameramen, soundmen, wardrobe lady, make-up artist, a clipboard-holding girl and a host of others whose job function was unclear to me. Wow! So many. I couldn’t help but compare this motley crew with what was at my disposal in my attempt at producing a short video clip to promote my book, Do You Wear Suspenders? 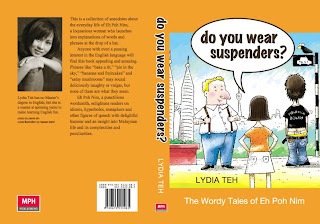 The Wordy Tales of Eh Poh Nim (MPH Group Publishing, 2009). Me, I only had Ian Kirk, who was director, videographer, video editor, script editor, set decorator and everything rolled into one. The PCK crew lugged in a load of equipment: TV sets, cameras, big bulky lights, laptop, microphones, reflectors, fans, garden furniture, directors’ chairs, coils of extension cord that could stretch all the way to Singapore and back, and black boxes of varying sizes that presumably contained all the mysteries of filmmaking. Fui-yoh! All that stuff! “I see you’ve turned green with envy,” a little voice piped up. Ignoring this annoying little voice, I searched the mob for curly hair and a flash of yellow boots. Alas, Gurmit Singh wasn’t there yet. I introduced myself to Harith Iskandar, who was playing PCK’s partner, Izzy, and Adibah Noor, who was going to be Izzy’s mother. They had arrived with the crew. Harith was slightly aloof but Adibah greeted me effusively as if I was an old friend. I was chuffed that they had both read Honk! If You’re Malaysian. Much later, when Gurmit strode in, I eagerly showed him my book. He stared at it blankly for a few moments. I pointed out his blurb on the back jacket, and he smiled, a tight little grin which was subdued and totally uncharacteristic of PCK. I was a little disappointed. Penny had met Irene Ang, who played Rosie, on the first day of shooting, and said Irene was very friendly. “What did you expect from him? That he’d beam from ear to ear, push out his chest and swagger? Hello, he may be wearing a mole, wig and yellow boots but Gurmit is not Phua Chu Kang. If all actors were like the characters they play, die-lah, you,” the little voice piped up again. I saw some of the actors going through their script when the cameras weren’t rolling, but once the director shouted “Action!” they spewed their lines effortlessly. They were superb. There was no twisting of tongue or hemming and hawing. They didn’t need any coaching from the director, especially Gurmit who had been playing PCK for 10 years. He could turn on PCK’s sneer and ebullience at the snap of the fingers. Watching him hug the young tree in my sister’s garden (PCK was in a tree-hugging phase), I couldn’t help but be impressed by how easily he slipped into character. These guys are real pros. “Yeah, not like you and your friends,” the little voice said. “Shut up!” I told the little voice.